To prepare the stewed vegetables: In a large frying pan over medium heat, heat the olive oil, add the onion and garlic and cook until the onion has caramelized, for approximately 2-3 minutes, moving the onion and garlic around the pan frequently to prevent burning. Add all the spices and condiments, the frozen and fresh vegetables and garbanzo beans, and cook covered for 15-20 minutes if you like your vegetables al dente, or longer if you prefer softer veggies. To prepare the couscous: Bring water to a boil with the salt and oil in a medium-sized pot. Turn off the stove and add the couscous to the water. Stir. It will be ready in about 5 minutes, since most couscous is pre-cooked. Serve stewed veggies over a bed of couscous, and enjoy while hot. Try adding chicken breast, lamb, fish or any other meat to the stewed vegetables. 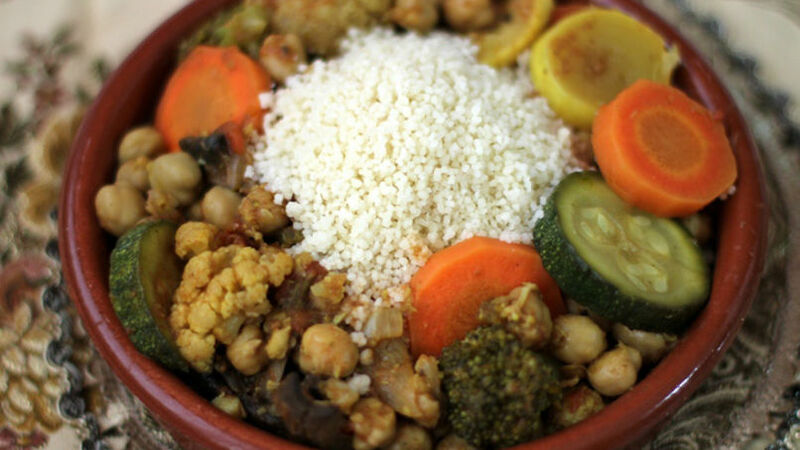 In place of water, use vegetable broth to prepare the couscous. The first time I tried couscous was in a salad I had prepared, topped with mango and a handful of other ingredients. I loved the delicioso sabor of that dish, so I decided it was worth the effort to include couscous in our menu at least once a month. Couscous is easy to prepare and it’s a great go-to dish during weeknights. Since it’s ready in only 5 minutes, it's even easier to whip up than white rice. You can serve it with stews, dried fruits and raisins, or add it to your favorite salad while it's hot, or after it’s been refrigerated, for a great add-on. This time I’ve paired couscous with stewed garbanzo beans and veggies, and the final product is outrageous!